The Yaris was launched at the World Auto Paris 1998, with the same golden hue. 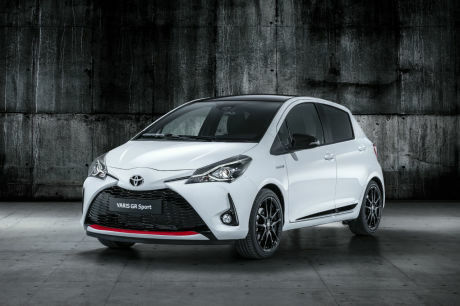 For the World Auto in Paris, the Yaris celebrates its twentieth anniversary with a new limited series, while the hybrid version starts at the sport through the new declination GR Sport. It’s been twenty years that the Toyota Yaris produced in Onnaing in the North. The city the japanese had in effect been presented to the World Auto 1998 and will celebrate its twenty-year career in the edition 2018 of the parisian salon, which will open its doors to the public on October 4th. On this occasion, Toyota launches the special series ” 20th anniversary “, which will be limited to 500 copies. Available with gasoline engines and hybrid, it will be launched at the end of the year 2018. This Yaris will be recognizable at first glance thanks to its golden painting, which takes up the hue with which her ancestress had been launched in 1998. The roof and the a pillar contrast with their color a dark gray, like the wheels ten-spoke (15-or 16-inch depending on the engine), the mirror caps, the side rods or the area surrounding the fog lights. A badge Y20 is affixed to the rear uprights. The cockpit replicates also this shade of dark gray, especially on the central console and the inserts of the steering wheel, as well as the upholstery fabric of the seats decorated with a checkerboard pattern. Note thata new multimedia system will make its entry on the Yaris vintage 2019. It will focus on the connectivity and will facilitate the sharing of applications with smartphones. 17 ” rims shod with the same Bridgestone Potenza RE50, a roof and a rear spoiler in black, a radiator grille with honeycomb-bee and mirror caps black. The interior also displays a sporty feel, thanks to its Sport seats in Ultrasuède black with inserts and white logos GR, driving the three branches is identical to that of the GT86, with its sky-black roof and chrome trim. However, this GR version Sport does not play on the aesthetics and benefits of improved suspension with the same shock absorbers Sachs Performance as the GRMN, while the ground clearance is reduced to 11 mm. The chassis is more responsive and the road behavior more dynamic. A pity that all this must be associated to the hybrid and the CVT… The Yaris GR Sport will be released by the end of the year 2018.